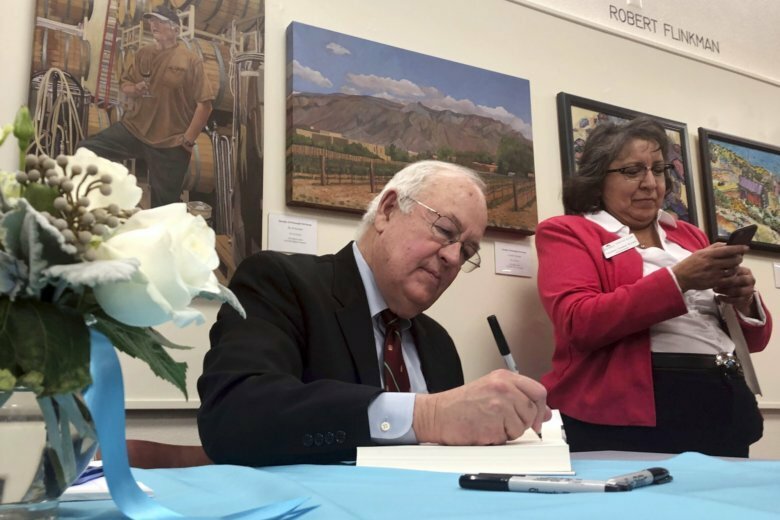 Former independent counsel Kenneth Starr signs a copy of his recent book "Contempt: A Memoir of the Clinton Investigation" at the University of New Mexico School of Law in Albuquerque, N.M., Wednesday, Jan. 23, 2019. Starr, who investigated President Bill Clinton, says he wants the public to trust the checks and balances in the system established to hold presidents accountable. (AP Photo/Mary Hudetz). Starr’s comments came ahead of a public lecture he delivered at the University of New Mexico School of Law. In his talk, he detailed more than a century of investigations involving the executive branch that have included the Watergate scandal, Starr’s own four-year Whitewater probe and special counsel Robert Mueller’s look now into whether the Trump campaign coordinated with Russia. The lecture was titled “Investigating the President, Now and Then,” with Starr — who remains a controversial figure — saying every investigation in the country’s history has been politicized, and suggesting that the divided views of Mueller’s probe are nothing new. “Investigations will be targeted with the charge of being politicized. But it doesn’t mean that it’s so,” Kenn said in an interview with The Associated Press. Two decades ago, Starr presented a report to Congress that that led to Clinton’s impeachment by the House on accusations the former president lied under oath and obstructed justice. Clinton was acquitted by the Senate. Starr’s lecture at UNM was originally expected to take place in October, before the law school postponed it. The university cited timing as a reason for postponing the talk. He left Baylor in 2016 amid a scandal over the school’s handling of sexual assault accusations against football players. Starr said his resignation was the result of the university’s board of regents seeking to place the school under new leadership following the scandal, not because he was accused of hiding or failing to act on information.